I am still in the process of reading this title, but I don't know what will be happening in life and I want to get it out there. So far it is a captivating, magical book that has been hard to put down. You know, one of those you can't wait to pick up. My normal reading time is in bed and lately I have been so tired, I go to bed and sleep. I'm catching up on sleep now so maybe tonight I'll get some reading in. I am really enjoying this book. It could very well be among my favorites - it has that feel. Meridia grows up in a lonely home until she falls in love with Daniel at age sixteen. Soon, they marry, and Meridia can finally escape to live with her charming husband’s family—unaware that they harbor dark mysteries of their own. As Meridia struggles to embrace her life as a young bride, she discovers long-kept secrets about her own past as well as shocking truths about her new family that push her love, courage, and sanity to the brink. Erick Setiawan’s astonishing debut is a richly atmospheric and tumultuous ride of hope and heartbreak that is altogether touching, truthful, and memorable. It's a light yet rich read that is as enjoyable for we adults to read as it was for us to read Snow White as a child. Buy this title at Simon & Schuster , Amazon , Barnes & Noble , Borders , IndieBound , & Powell's . 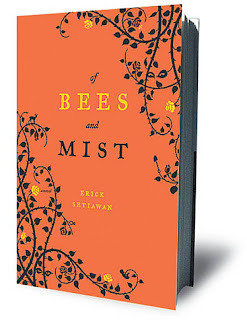 Three lucky readers will win a copy of " Of Bees and Mist"
*Follow me @jamaise at Twitter & Tweet this : RT @jamaise #GIVEAWAY #WIN -a copy of " Of Bees and Mist " by Erick Setiawan - amazing book! 3 Winners! http://bit.ly/aSxKbu Ends 8/8 tweet each day for one entry each ! Disclaimer: The publicist provided me with a free sample of this product to review, and I was under no obligation to review it if I so chose. Nor was I under any obligation to write a positive review or sponsor a product giveaway in return for the free product. These views are my own. I actually like that is like a like a fairytale. I think they are really underappreciated. I am a gfc follower. I love when books span across multiple generations. Your enthusiasm for this book has piqued my interest. I am interested in magic books that are captivating and I think Of Bees and Mist is one I would like to read. Entered your The Baby Bunch ~ Crayon Rompers ~ GIVEAWAY!!! I follow on GFC and would love to read this. It sounds wonderful. I am a google friend follower. They always say not to judge a book by its cover. But this cover looks great and the title seems very interesting to me. And overall I am a big book fan. Sounds like it transports the reader to another time & place -- pure fantasy and enjoyment. This sounds like it would be interesting to read. I am an avid reader. I have always enjoyed stories that have an element of magic and history in them. This one sounds like I would like it. I entered the Gourmet Body Treats GIVEAWAY. I entered the Wishing Elephant GIVEAWAY. I want to read this because spirits and spells, witchcraft and demons, and prophets and clairvoyance sounds interesting. 1. I follow you on GFC. 2. I follow you on GFC. 3. I follow you on GFC. 1. I entered SKLZ ~ Sport Brella. 2. I entered SKLZ ~ Sport Brella. 3. I entered SKLZ ~ Sport Brella. 1. I entered Thomas & Friends : Creaky Cranky. 2. I entered Thomas & Friends : Creaky Cranky. 3. I entered Thomas & Friends : Creaky Cranky. I entered Gourmet Body Treats ~ $50 Gift Certificate. I want to read this because now I need to know what her family secrets were and what her husbands' family secrets are too. You pulled on my interest string. I would like to read this because i am into all different kinds of books and this one looks interesting. I would love to read this because anything that includes "a mythical town where spirits and spells, witchcraft and demons, and prophets and clairvoyance are an everyday reality." is my kind of book! I love the blend of magical/fantasy and reality. Sounds intriguing! simply put, it seems interesting.